Caughie, John, Griffiths, Trevor, Velez-Serna, Maria A. (eds), Early Cinema in Scotland (Edinburgh: Edinburgh University Press, 2018). 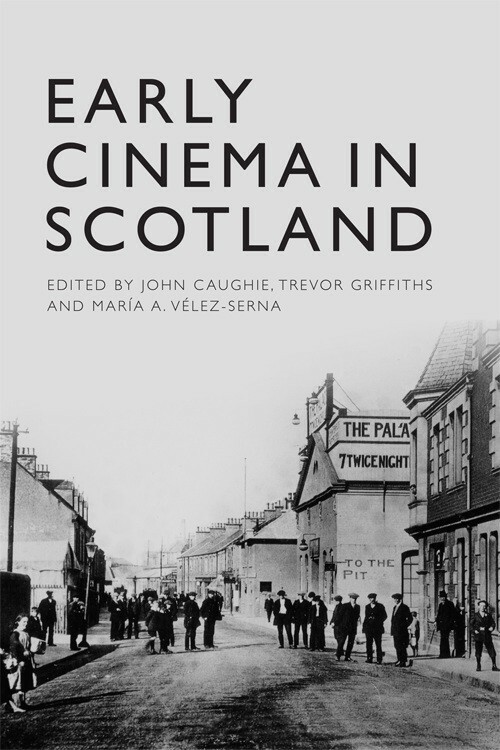 Readers might also want to refer to Dr Trevor Griffith’s 2012 publication, The Cinema and Cinema-Going in Scotland, 1896-1950 (Edinburgh: Edinburgh University Press, 2012). Caughie, John, ‘Early cinema in Scotland: film and literature’, in Scottish Studies International, v. 41 (2017). Velez-Serna, Maria A. and John Caughie, ‘Remote locations: Early Scottish scenic films and geo-databases,’ International Journal of Arts and Humanities Computing 9: 2 (2015), 164-179. Velez-Serna, Maria A., ‘Preview screenings and the spaces of an emerging local cinema trade in Scotland,’ in Historical Journal of Film, Radio and Television (2015). Archibald, David and Maria A. Velez-Serna, ‘Kilts, Tanks and Aeroplanes: Scotland, Cinema and the First World War,’ NECSUS: European Journal of Media Studies (Autumn 2014). Bohlmann, Julia and Maria A. Velez-Serna, ‘The “Early Cinema in Scotland” project goes to school,’ Media Education Journal 56 (2014), 23-25. Bohlmann, Julia, ‘Early Cinema and Juvenile Crime in Scotland: Edinburgh’s Chief Constable at the 1917 Cinema Commission’, in: Networking Knowledge, v. 6, n. 4 (2014). Caughie, John, ‘Small town cinema in Scotland: the particularity of place’, in Judith Thissen and Clemens Zimmerman (eds), Cinema beyond the City: Small-town and rural film culture in Europe, (London: BFI/Palgrave [Cultural Histories of Cinema series], 2016). Caughie, John, ‘”Scotched”: the subject of history and the clutter of phenomena’ in Daniël Biltereyst, Richard Maltby and Philippe Meers (eds), Routledge Companion to New Cinema History (London: Routledge, forthcoming, 2017). Velez-Serna, Maria A. ‘Showmanship Skills and the Changing Role of the Exhibitor in 1910s Scotland’, in Askari et al (eds) Performing New Media 1890-1915 (New Barnet: John Libbey, 2014), 105-114. Griffiths, Trevor, ‘Sounding Scottish: Sound practices and silent cinema in Scotland, in Julie Brown & Annette Davison, The Sounds of the Silents in Britain (Oxford: Oxford University Press, 2013). Early Cinema in Scotland blog: Archived blog posts from the project, including case studies and reflections by different authors. Velez-Serna, Maria A. and David Archibald, Joining Up: Scotland, Cinema and the First World War [video, 10 minutes] [In]Transition (July 2015). Pickard’s Papers project, in partnership with the Britannia Panopticon Music Hall Trust and funded by Heritage Lottery. Digitisation of archive collection, website development, volunteer-led activities and print material. Velez-Serna, Maria A., ‘Anti-war movements and the media’, Spirit of Revolt (January 2015). Velez-Serna, Maria A., ‘Singleton Snr. and the Burnbank Picture House,’ Cinema City website, Glasgow Film (2014). ‘Cinema and the First World War in Scotland’ (2014), learning resource for secondary schools, in collaboration with Allison Gillen, Julia Bohlmann, Glasgow Film, and Scottish Screen Archive. ‘What is Cinema History?’ A HoMER conference, Glasgow, June 2015 (local coordination). Caughie, John ‘Early cinema in Scotland, 1896-1927’, Scottish Consortium for Film and Visual Studies, 8 June 2012, Dunkeld. Caughie, John, ‘Early Scottish cinema: the local, the rural and the public sphere’, NECS–European Network for Cinema and Media Studies conference (HoMER strand), 20-22 June 2013, Charles University, Prague. Caughie, John, ‘Early Scottish cinema: the local, the cosmopolitan and the public sphere’, International Screen Studies Conference: Cosmopolitan Screens, 28-30 June, 2013, Screen/University of Glasgow, Glasgow. Caughie, John, ‘The detail that derails: the problem of the local and the national in early Scottish cinema’, NECS–European Network for Cinema and Media Studies conference (HoMER strand), 19-21 June 2014, Universita Cattolica, Milan. Caughie, John, ‘”Hee-haw but scenery”: scenics and settings in early Scottish cinema’, International Screen Studies Conference: Landscape and Environment, 27-29 June, 2014, Screen/University of Glasgow, Glasgow. Caughie, John, ‘Early cinema in Scotland: film and literature’ First World Congress of Scottish Literatures, 2-5 July, 2014, Glasgow University, Glasgow. Caughie, John, ‘Space and place: early cinema in Scotland’, Scottish Network of Modernist Studies, 17 February 2015, University of Strathclyde, Glasgow. Caughie, John, ‘Scotched: the subject of history and the clutter of phenomena’ (Keynote presentation), ‘What is Cinema History?’, Joint conference between HoMER (History of Moviegoing, Exhibition and Reception) and the Early Cinema in Scotland project, 22-24 June, 2015, University of Glasgow, Glasgow. Velez-Serna, Maria A. and Caroline Merz, ‘Fitba' Daft: Scottish sport and the silent screen,’ Scottish Sports and the Arts conference, Edinburgh, September 2015. Velez-Serna, Maria A., ‘Layering sources, mapping events: A sceptical data model for cinema history,’ ‘What is cinema history?’ conference, Glasgow, June 2015. Velez-Serna, Maria A., ‘An intermedial geography of early cinema in Glasgow,’ Society for Cinema and Media Studies, Montreal, March 2015. Velez-Serna, Maria A., ‘Film distribution in Scotland in the 1910s,’ Society for Cinema and Media Studies, Chicago, March 2013. Velez-Serna, Maria A., ‘The trade show as a reception context in 1910s Glasgow,’ European Network for Cinema and Media Studies, Milan, June 2014. Velez-Serna, Maria A., ‘Why study cinema programming – and how,’ European Network for Cinema and Media Studies, Prague, June 2013. Velez-Serna, Maria A., ‘Cinema programming as a cosmopolitan practice in 1910s Scotland,’ Screen, Glasgow, June 2013. Bohlmann, Julia, ‘Early Cinema and the Young in Scotland in 1917’, NECS–European Network for Cinema and Media Studies conference (HoMER strand), 20-22 June 2013, Charles University, Prague. Bohlmann, Julia, ‘Early Research into Educational Cinema, 1917-1933’, Children and Nontheatrical Media Conference 2013, 11-13 April 2013, University of Glasgow, Glasgow. Bohlmann, Julia, ‘Early Municipal Cinema in Scotland: Socialist Agitation or Civic Entertainment?’, ‘Social History Society Conference’, 31 March- 2 April 2015, University of Portsmouth, Portsmouth. Merz, Caroline ‘Rob Roy: Britain’s first three-reel film’: British Silent Film symposium, 2 May 2014, Kings College, London. Merz, Caroline ‘Cinema Colleges and Football Daft’: ‘What is Cinema History?’, Joint conference between HoMER (History of Moviegoing, Exhibition and Reception) and the Early Cinema in Scotland project, 22-24 June, 2015, University of Glasgow, Glasgow. Velez-Serna, Maria A., ‘Researching the geography of early cinema in Glasgow,’ Screen Seminars at Glasgow, February 2015. Velez-Serna, Maria A., ‘Geo-databases and films: Experiences from a cinema history project,’ University of Liverpool, doctoral training workshop on digital humanities, February 2015. Velez-Serna, Maria A., ‘(Micro)film Studies,’ University of St Andrews ‘Remote Access’ PG event, February 2015. Velez-Serna, Maria A. and David Archibald, ‘Protests and Parades: The First World War in Glasgow’s Cinemas,’ Switzerland in Dialogue symposium, Glasgow, October 2014. Velez-Serna, Maria A., ‘Scottish film renters in the silent era,’ University of Stirling research seminars, October 2014. Velez-Serna, Maria A., Roundtable on archive research, University of Glasgow, Postgraduate Symposium, May 2013.